It’s Hot…..We’ve Got Ice ! It’s Hot…We’ve got Ice ! I think every person that has walked through our doors today has said,” it is so hot outside”…yes, it is summer and July is here. 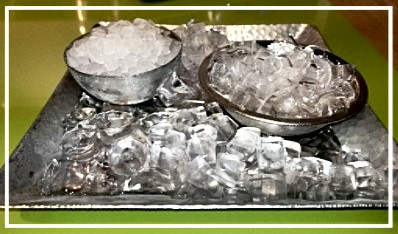 To help cool you off, make your drinks nice and icy, or maybe you need a few ice cubes to throw down your shirt….we’ve got ice, and a variety of Ice machines on display, ready for you to see up close and personal. 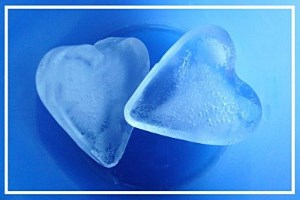 We don’t actually sell machines that make heart shaped ice… but that would be awesome and we do love our ice ! At Aggressive, we carry a good variety of Ice Machines, not to be confused with the Ice Makers that live inside your freezer. Ice machines are under counter units, in our showroom we have the following brands(in alphabetical order) ~ GE Monogram, Kitchen-Aid, Manitowoc, Marvel, True, SubZero, Uline and Whirlpool. ….and even better, our machines are “live” so you can grab some cubes, and taste and sample while you shop. 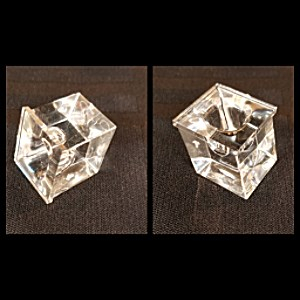 The ice cubes produced by these machines have unique shapes, are actually quite beautiful, and several machines produce similar shaped cubes….each brand mentioned will be highlighted with a link to their respective websites for you to see specifications and a general idea of pricing. 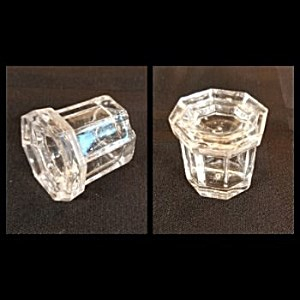 Ice from Subzero and Manitowoc machines…clear, with no odor and clean taste due to excellent filtration system, have unique octagonal shape and melts slowly. Ice from Scotsman Brilliance, GE Monogram and True clear ice machines… won’t clump or dilute drinks, also melts slowly and cools drinks quickly. Ice from Kitchen-Aid, Jenn-Air , Whirlpool and Marvel…clear ice, water filtration system, shape takes up less room in your glass. 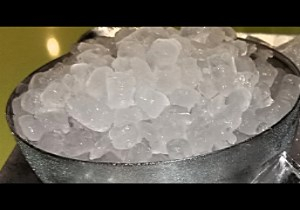 Ice from Uline ice machine…clean and clear, unique shape. Nugget ice from Scotsman machine… compared to “Sonic” ice, soft and chewable and a favorite of our staff. This is only a sampling of the ice machines available, our sales staff will help guide you to the best machine to fit your needs and your space. It’s hot….stop by the showroom, sample some ice and discover which machine you can’t live without. It occurred to me on my latest appliance adventure to Missouri that garages have made a major impact on American history. From music, to computers, to appliances…..they have been an integral part in making magic happen in many industries. After hearing that Bob Trulaske, his father, and his brother went to work on the first roll-top-soda-pop-storing refrigerator in a garage, it made me giggle a little because well….another American garage invention success story. So who was Bob Trulaske? He is the founder of True Manufacturing, the world’s leading commercial refrigeration supplier. Founded and made in St. Louis, Missouri, 75% of the raw materials used are sourced from the USA. It’s not a shock that Bob also served in the military and was a World War II Veteran. While sitting in their local pop shop, Bob and his brother came up with the idea for a refrigerator that wouldn’t need an expensive block of ice. They promised the owner that when they made their first refrigerator it would be his. So in their garage they built the first commercial soda refrigerator. This roll-top caught the attention of 7-Up and Coca-Cola. These companies wanted these refrigerators and True was more than happy to oblige! Later in the 70s they took a shot at more than just beverage coolers and ventured into the food service industry. People thought they were nuts. What did they know about the food service industry? Considering that the company is in the majority of today’s restaurants, we can see that naysayer hadn’t a clue as to the true capability of True‘s ability to figure it out AND be the best. Fast forward to 2008 when True decided to take another chance in yet another division they knew nothing about…..the residential market. Again, they were told they were nuts. What did they know about the residential market? Yup. Imagine that? With that in mind I could picture them laughing as they brought to market an uncomparable product line chock full of pieces like a 42″ and 48″ built-in refrigerator with true commercial qualities, under-counter refrigeration, wine preservation, beer dispenser, and an ice machine. True offers decades of commercial quality brought to market in their residential line. Features such as stainless interior, serious compressed insulation, a 3 year warranty, and all under-counter products being indoor AND outdoor rated, are just some of the perks to their residential line. It can’t all be commercial though….so they add wonderful features such as colorful, choice lighting and stainless steel buttons, backed by hundreds of thousands square footage of manufacturing capabilities. We have these exceptional pieces on display. Stop in so I can infuse you with the same excitement I experienced walking the historical factory that has had a huge, true impact on appliances throughout the world. Truly True. True to and for You. A client of ours, Wally David, walked in and was looking for a “soft ice” maker. While I was unfamiliar with the term “soft ice”, I showed him three under-counter models. As it turns out “soft ice” is what I know as “nugget” ice, which is also known as “cubelet” ice, and “Sonic” ice (because Sonic uses it). We both took a few nuggets out to taste/crunch test. This immediately brought me back to winter in Jersey. It was just like eating freshly fallen snow, only bigger and more substantial! Perfection! 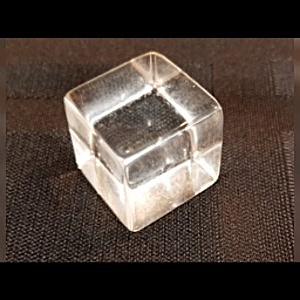 While there is a variety of cube choices and ice makers, after our little tour I am now biased and have decided to focus this blog on my new favorite ice……nugget ice. After picking in-house sales consultant Dean Snyder’s brain here are some pros and cons to nugget ice. First the pros. It is chewable. So while ice chewing isn’t ideal by dental standards, this ice is easy on the teeth. The reason it is easier on the teeth is because it truly is “softer”. Nugget machine ice is formed by an ice shaving process so it is less dense than clear ice machine production that is layered with water. It’s not frozen solid as non-nugget machines. This type of cube will take on the flavor of the drink it is in because of its “softness”. It holds the drink. So after you’ve gulped down your beverage, you’ll have a tasty treat to crunch and munch on! This type of ice never gets stale because it is made and melts quickly. Now the cons. It is not a clear ice machine and therefore it does not rid itself of impurities in the water. This is why it is a good idea to have filtered water hooked up to the unit. It also melts quickly. 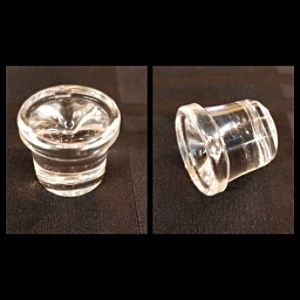 This could actually be a pro if you want a slightly diluted drink. Also, a unit that makes nugget ice could be as much as twice the price of other ice makers. If you are interested in taste testing our cubes and machines, stop in to our showroom with your favorite beverage to test out our cubes and choose your favorite!